When you partner with Divvy, you get all the benefits of our unique printing technology. Our API (Application Programming Interface) makes it simple for you to print any file type, from any server configuration, for any printed product! Our technology offers us the flexibility to work with whatever a client needs printed. We want to make this easy on you and the many other companies and franchises we partner with. No matter what server configuration you use, we connect it to our servers for automatic batching. That means you don’t have to conform to our presets or technology, like other printers require. With this flexibility, we can serve more customers with many different needs. Plus, our software can work with whatever print file types you use! No need to convert to a more common file type just to suit us. Divvy is made to help you, not the other way around. With benefits like these, Divvy saves you money and time on your printing orders. You’ll be able to make a profit and meet your deadlines easily! Divvy fulfills all of your orders directly to your intended locations, no matter where they are. All of your franchisees will receive your products about the same time, allowing you to have a smoother startup to any campaign or promotion. 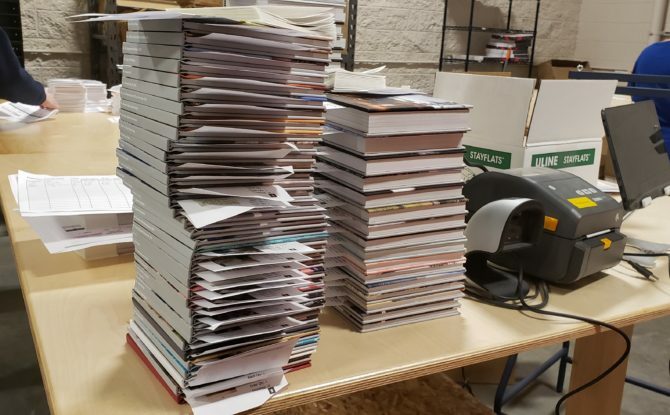 Because we fulfill and ship printed products in-house, we can provide better shipping rates and handle high-volume shipments. We also have partnerships with all the major mail carriers, getting you the best shipping deal possible for all of your orders. Many of our potential customers already have printers that they work with. However, don’t let this stop you! Even if you switch printers, we can take what you already have and sync it easily to our system. The transition can take days or a couple of weeks, rather than months! Other printers take much longer to get your system synchronized to ours. With Divvy, it’s easy to switch! Don’t have the technology? Our technology department can build the configurations for you! Have we convinced you yet? It’s as easy as giving us a call today! Automation powers our modern printing world. Any size of business benefits from automation, whether you require a full-blown marketing campaign package or a simple reminder system. This is where Divvy thrives. Our automation processes make it easy for you to send mail pieces, invitations, and more! Whether it’s just for one event or for thousands of customers across the country, we can do it all! 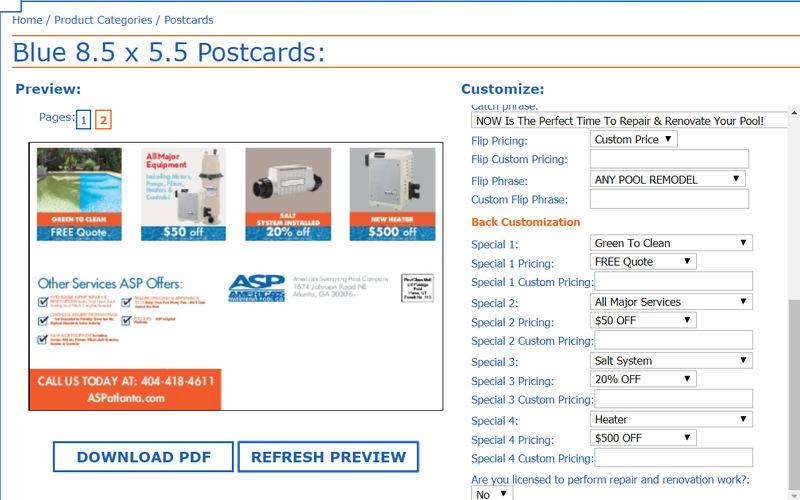 Automated direct mail makes marketing simple. You can send mail, news, and special offers to your customers. You can reward loyal customers and win over new ones. Better yet, we can enhance your direct mail pieces with UV spot varnish or digital foil. Research has proven that paper pieces with texture get a better response from consumers. Not only do they tend to purchase more; they’ll trust your business! It’s what our brains are wired to do. In our busy lives, we need a lot of reminders. And many businesses utilize them, especially in the medical or beauty industries. Missed appointments cost these industries millions annually! SO it’s important to stay on top of sending reminders as well as making them for ourselves. Most of these companies and practices might just use email reminders or text reminders. While this is simple and convenient, it’s much better to combine digital reminders with physical. You’ll get twice the effectiveness that you might get from using only email or text. Older customers, for example, may not be as efficient at using text and email–and for them, these reminders could be very important! Or, Millennial customers might want that physical reminder to better keep track in the storm of emails and texts they already receive. We can even put variable data on each mail piece. This includes names, the date of their last appointment, and more. 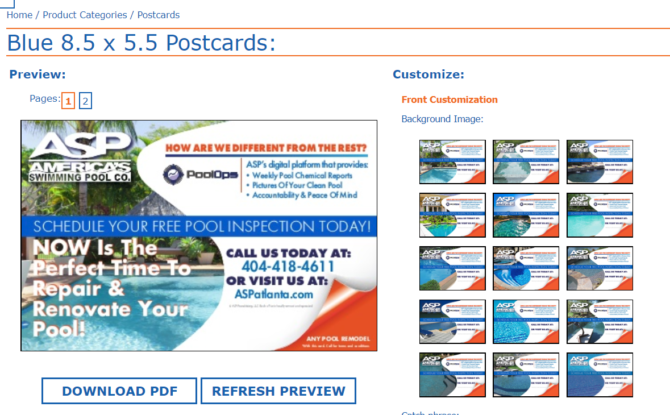 Adding custom data is a great way to get your customers to respond to your mailers. Using their names especially establishes a personal connection, building trust in your practice or business. Even if your business doesn’t need reminder pieces, chances are you can still benefit from automation. If your franchise is holding a promotion, you’ll need a way to reach these clients. A pizza chain, for example, might have a pop-up advertisement on their site for those customers ordering online. But they would be most effective to supplement it with a physical mailer reminding their most loyal customers of the latest deals. And in this case, they already have those addresses! All they need is the mailer. Businesses can also advertise events, like grand openings or major sales. Emails might get buried and forgotten, but a mailer–whether left on the counter or put up on the fridge–will help remind your customers. When they head out for a day of shopping, they’ll be more likely to remember your promotion or event! Of course, mailing each of these on your own would be a real drain on time and energy. Sending your own mailers amounts to hours of stressful time you could spend doing more productive things. But Divvy handles all of that. 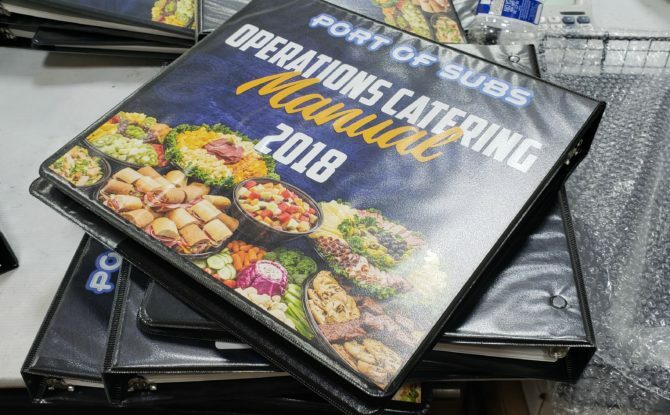 Once the job is done, we’ll fulfill your orders, sending them straight to the recipients. You can be sure the final invitations get where they need to go on time. Let Divvy handle your direct mail pieces and invitations from start to finish. Call us today to find out how we can help your business save time in this important process. 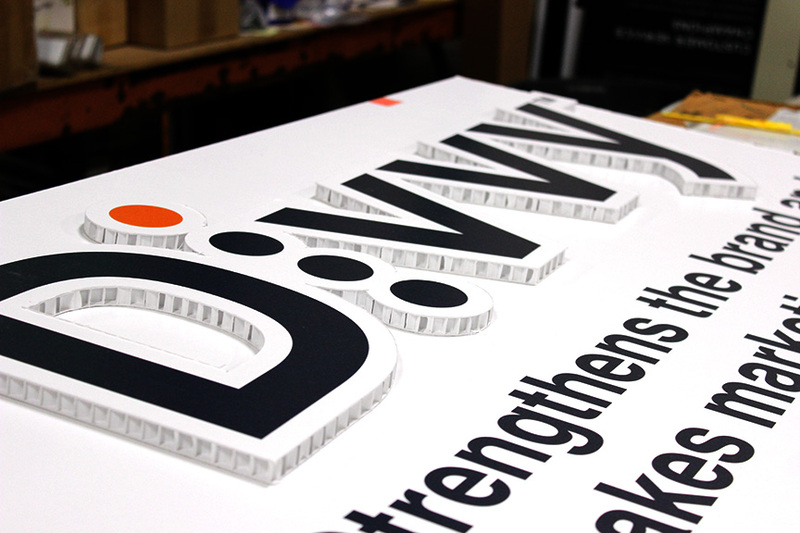 Divvy has excelled in signage and large format from the beginning. When we started, local stores and restaurants came to us for the variety of signage options and capabilities that we offered. 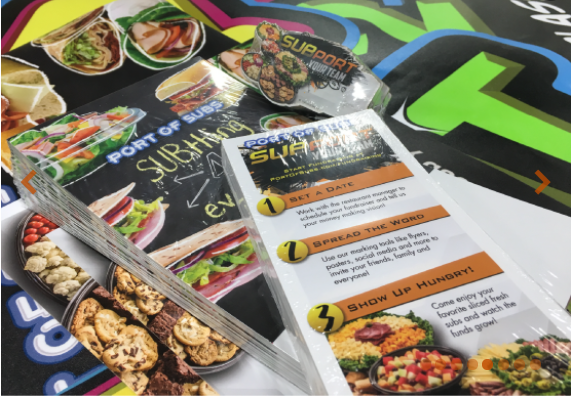 Today we supply multiple franchise brands throughout the United States with full in-store displays including window vinyls, table tents, wall and floor graphics, and various pop-up and fabric tension displays. See what you can do for your business! Catching attention at a trade show or convention is essential. Thousands of potential clients walk by hundreds of other booths, and if you blend into the crowd, you’ll have wasted your time. Using banners, POP signs, and three-dimensional signs grabs attention right away and helps you stand out from other businesses. You can also turn your booth into one big advertisement! Divvy’s large format printing capabilities can help you build an attention-grabbing booth perfect for any space at a convention. Putting up signs and ads is the best way to share promotions with customers already in or near your store. Within a store, you can use a variety of sign types for promotions and product advertisements. This could be small stands throughout a store, POP (point of purchase) signs for special member deals, and window clings to attract passersby. While the primary use of signage may be to promote products and services, it has another valuable purpose: decoration. A bland store or office may leave visitors feeling underwhelmed. And they may transfer that feeling onto your products, whether or not they’ve already bought them. Office signage can dress up your restaurant, store, or office, whether or not it’s a direct promotion of a product. It strengthens your brand and, in the case of restaurants, might get patrons’ appetites going for your food. It sets the mood you most want to convey in your brand, and makes your company a better place to work. Divvy by Alexander’s excels in all things large format! We’ll help your signs and advertisements stand out above the rest, no matter your needs. If you need signage for your next promotion or just to dress up your building, come to us! Even better, if you need signage across your whole franchise, we can keep your brand on point across every store. Contact us today to find out how! In a crowd, you’ll need to stand out. There are few places where this is truer for your franchise than at a trade show booth. Among so many others, look of your booth can speak far louder than your product or even your staff. Since your trade show booth’s design is the base for success at a show or convention, we’ve got a few tips to help you win the crowd even surrounded by your competition. Match your logo and colors, top to bottom of your booth. Every item should represent your business–even the chairs, if you can. Brand your pens and giveaway items, too. Even at large events, you’ll be able to maintain recognition among the crowd. At a glance, you’ll need to show exactly what your company does. Don’t assume that people will know what you do by your name and colors alone. You can put information about your product or services on a large banner, or somewhere else people will see it. At a trade show, you don’t only have to focus on business. That’s what less memorable booths will be doing–leaving their area static and without anything interactive. Turn your booth or product into a game or a venue, and let your visitors play. For example, at RootsTech 2017, one memorable booth had a device similar to an Oculus Rift for guests to play with. Their setup was both history lesson and game, letting guests put on goggles that let them see Renaissance-era Europe at any angle. This was a fun way to tie in their emphasis on access to historical data around the world. Having some fun with your booth will help make it more memorable in a sea of booths. We don’t mean the kind of junk that ends up forgotten at the convention or worse, in the trash. Give away something your visitors will use! Give away food and drinks with your name and logo on them. Your visitors may not hang onto them forever. But they’ll appreciate a pick-me-up, and associate your booth with that positive feeling of relief from exhaustion or hunger. Whether you have a tiny 5×8 foot booth or a spacious block, use every square foot! You can show off your product with a banner in a small space. And remember that you can use height as well! Use balloons or banners from a high ceiling to draw visitors’ eyes–even from a distance. In a large booth, it’s important to keep it uncluttered. Large walls and presentation areas can quickly overwhelm with too much design. Remember here that less is more, and work on sleek but attractive looks for your large space. Your booth is not the only thing on display. Remember that you and your staff members will be as well! These etiquette tips can help you appear as professional as your booth design. Divvy can help you create a trade show booth to fit your needs, whatever they may be. Plus, we’ll create it in such a way that it’s easy to put together yourself. You won’t have to hire anyone or struggle with clunky pieces. Then, it’ll be easy to disassemble and return to your corporate offices. Want us to design it for you? We can do that too! We’ll use your brand colors and design it to fit any space at any convention. If you’re looking for help with a trade show display or booth, contact us. We’d love to help. You can’t risk wasting time when it comes to marketing your business. In today’s fast-paced world, promotion is a race. And in trying to be the first to get noticed, some companies hit the road with their promotions. These companies market everywhere they go with vinyl vehicle wraps. 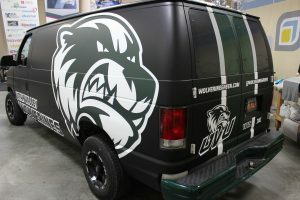 Wraps and vinyl for your car works for any business, from a major company to a university, down to tiny local companies. Divvy can help you do more than slap a simple sticker on your back windshield. We can work with you to create the best wrap and decals for your vehicle and brand. We’ll work with you to create the best wrap for your vehicle. The design can come from your designers, or we can create one for you. To make it fit your car perfectly, we’ll place the design in a template that matches the make and model of your vehicle. We want to make sure that it looks absolutely perfect for you when it’s finished! Divvy prints the design on-site, using vinyl that will weather the elements on any vehicle. We will also install it on your vehicle on-site. When installing it, we’ll create an environment perfectly suited to a clean application that will keep your vinyl long-lasting and glossy. How long does our vinyl wrap stay on your vehicle? Usually, up to 5 years. Others not suited to the outdoors can last only as long as 2 or 3 years. 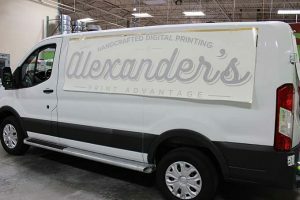 For larger vehicle wraps that cover the vehicle, we’ll print them in several overlapping pieces. These pieces go on by hand, and our team uses a squeegee to prevent wrinkles and air bubbles that will destroy the look of your wrap. We’ll also hand-trim it around corners, mirrors, handles, wheel wells, and moldings. Now that your vinyl vehicle wrap is finished, go get on the road! The visibility of wraps promotes your business anywhere you go. Your company’s colors and design, too, make your branding recognizable for even those who haven’t seen your business in person yet. Should you decide to change your design in the future, our vinyl is easy to remove from your vehicle. And it won’t damage your paint or leave a sticky residue! Have more questions about vehicle wrapping? Have a vehicle you want to wrap? Contact us today! 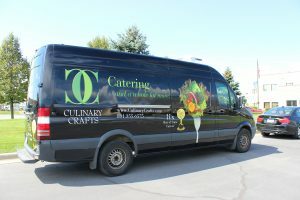 We’ll work with you to create the perfect vinyl vehicle wraps for your franchise. When holding an event, you’ll want to grab your customers’ attention as quickly as possible. Wherever you are and whatever the event, a lot of people could walk by without paying much attention to your storefront or booth. Unless you use three-dimension signage–namely, standees! Standees help catch the attention of people passing by and immediately show off your brand. They are far more interesting to look at than regular, flat signage. And best of all, with Divvy, you don’t need to accept printing limitations on your standee! 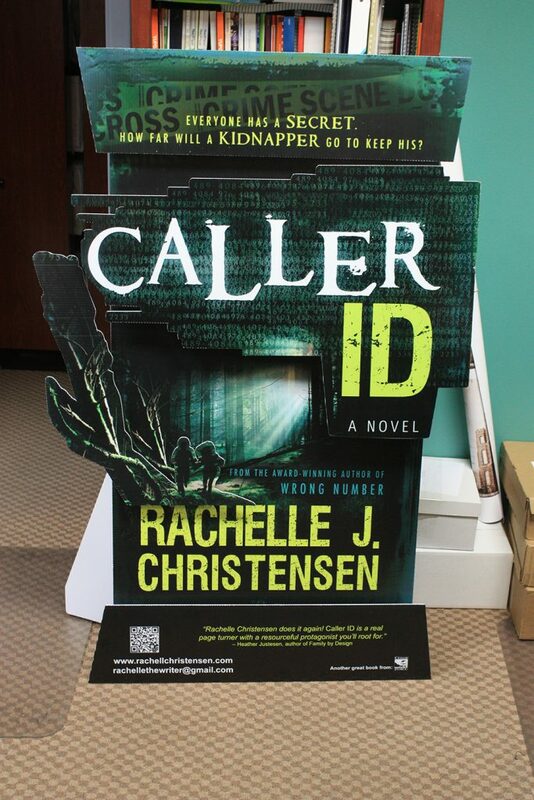 Every standee begins with an eye-catching design. These displays are your chance to think outside the box. Don’t just go for the standard rectangular shaped sign. Incorporate odd shapes and colorful images. Make this design 100% yours. Using more creative shapes and brand elements strengthens the overall look of your business, particularly in a storefront. When preparing to design, examine your space–whether in an individual store or at a trade show. Consider where you can place the standee to create the most drama, and design your display to fit that specific area. With Divvy, you don’t need to worry about altering your design to fit our print capabilities. We can print whatever you need on a wide variety of materials! This leaves you free to design as you wish to fit your business, not ours. We choose light but sturdy materials to help the standee last once it reaches the franchise location. We want your piece to look good through the length of the whole promotion! Depending on our customers’ needs, we can print on any rigid, non-fragile material. 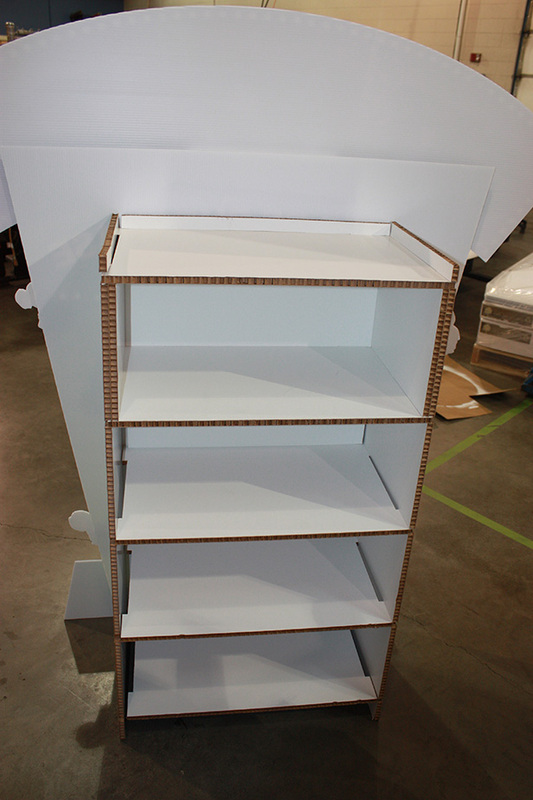 For instance, we might create a three-dimensional piece for a client out of foamcore or falconboard. Both materials are good for layered, 3D images and for putting a display in front of a trade show booth. 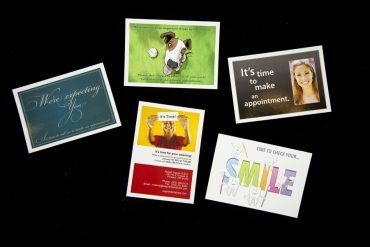 Most often, we print on coroplast, a corrugated plastic material that holds up well, but also allows for bending and is easy to cut. Coroplast is a great material for outdoor signage, or for standees that need to handle a little wear-and-tear. Remember: design a standee for the area it’s in. You’ll want the most eye-catching display possible without eating up a walkway or creating some other hazard. Depending on your material, you can move a standee in and outdoors to catch the eyes of passersby on the street. Dynamic signage, after all, tends to seize attention, which will lead to customers and clients entering your store to learn more. Standees work far better than regular, flat signage. After all, even with a great design, flat images can lose a person’s attention quickly, or fail to grab it in the first place. But three-dimensional signs stand out (literally) in the physical world, not just on glass. That demands attention right away! Tight on space? 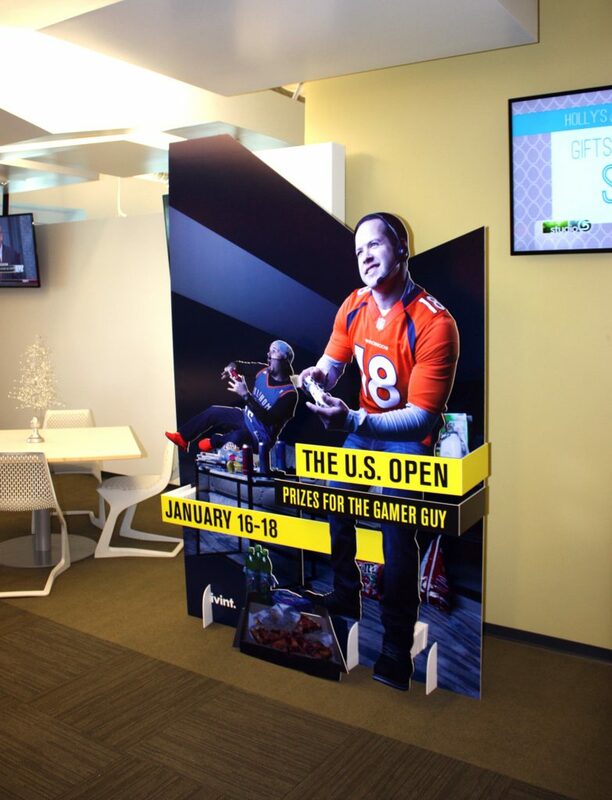 During events or in small franchise units, our standees combine stability with creativity and practicality. This sign hides a surprise behind its design: falconboard shelves! Here, you might store fliers or forms, handouts, and giveaway prizes. We also make three-dimensional signage for any occasion or style. Every layer in the design keeps your eye on the sign, which keeps the customer engaged–unlike regular, static signs. Imagine how effective this might be on your standee! See how Divvy can help your business grab and keep your customers’ attention today. Call us for a consultation or to share your ideas!